With the current media attention being paid to the problem of childhood obesity parents are beginning to realise the importance of encouraging their kids to maintain active lifestyles. 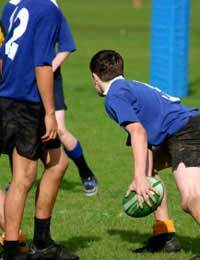 Organised sports often appeal to children and teens but many parents worry about the safety of some especially contact sports. While there is no doubt that there is some risk involved in playing contact sports, with proper instruction and appropriate safety gear, most kids can safely enjoy participating in the sport of their choice. Because their bodies are still growing, kids are more susceptible to sports related injuries than adults, so special cautions must be taken when allowing children to play contact sports. Developing tendons, bones, muscles, and ligaments can be injured, and growth plate injuries are large concerns. These areas of cartilage and bone growth are not as strong as tendons and ligaments, so what would be a minor injury in a mature body can turn into a serious complication for children. Teachers and coaches should never push kids to play when they are injured; children's sports need to be about safe fun rather than focusing predominantly on winning. Safe, well run programs for kids are necessary and parents must insist that their children are protected as much as possible from injury. It's a good idea to interview coaches before enrolling children in a program to be sure that they are taking safety seriously. Good sportsmanship, camaraderie, and fun should be the goals, especially for younger children. While everyone likes to win, children should never pay for victory with their pain and suffering.In addition to the coaching staff, parents should inquire as to the care and maintenance of athletic equipment and play areas. Fields should be even and well maintained, and all equipment must be properly sized for the children and in good condition. Finally, the best athletic programs for children group the kids according to size and ability rather than merely dividing them into age groups. Kids develop at different rates, so children of the same age may vary greatly in size, posing a risk to smaller kids paired against larger ones. While responsible instruction and a well run program are necessary, it is still important for parents to take additional steps to help ensure their children's safety. Kids should undergo a complete physical exam before embarking on a new sport or fitness program. Underlying medical conditions may prohibit some children from participating in rigorous activity, and contact sports pose specific other risks to vulnerable children. Sporting goods can be expensive, but parents must consider the well being of their children when choosing appropriate athletic and safety gear. It can be tempting to pass equipment down from child to child, but care must be taken to be sure that the items are not only in good condition, but are also sized correctly for the receiving child. Damaged or ill-fitting safety equipment will not protect children from injury. Lastly, parents must restrain themselves from pushing their kids too hard to perform well on the athletic field. Parental enthusiasm can put kids at risk if they feel that they'll let their parents down unless they play to win. No one wants to see their child suffer an injury, but it can happen. In addition to the times when immediate care is obviously required, such as cuts, sprains, strains, and (yikes) broken bones, repetitive motion can cause overuse injuries. Fractures and even bone deformities can result from continual repetitive use of a single muscle or group of muscles. Kids aren't always upfront about the degree of their injuries, especially as they get older and are afraid that they'll look weak if they complain of pain or have to sit out of a game. Parents should look for signs that their child is suffering any discomfort. If a child seems to have trouble finishing a game, or experiences any tenderness or swelling, it should be looked at. Additionally, any head injury or blow to the chest or torso warrants an examination by the doctor. When it comes to the safety of our kids, we can never be too careful. Let them play, but do it sensibly.